Functional endoscopic sinus surgery (FESS) is a minimally invasive surgical procedure that opens up sinus air cells and sinus ostia (openings) with an endoscope. The use of FESS as a sinus surgical method has now become widely accepted; and the term "functional" is meant to distinguish this type of endoscopic surgery from nonendoscopic, more conventional sinus surgery procedures. The purpose of FESS is to restore normal drainage of the sinuses. Normal function of the sinuses requires ventilation through the ostia (mouth-like opening) and is facilitated by a mucociliary transport process that maintains a constant flow of mucus out of the sinuses. All sinuses need ventilation to prevent infection and inflammation, a condition known as sinusitis. In healthy individuals, sinus ventilation occurs through the ostia into the nose. The sinuses open into the middle meatus (curved passage in each nasal cavity) under the middle turbinate (thin, bony process that is the lower portion of the ethmoid bone in each nasal cavity), which together are known as the osteomeatal complex, the key area of the nose. The hair-like cilia direct the flow of mucus toward the ostia. Sinusitis develops when there is a problem in the area where the maxillary and frontal sinuses meet near the nose or, occasionally, by dental infection. When sinusitis occurs, the cilia work less efficiently, preventing the flow of mucus. The mucous membranes of the sinuses become engorged, resulting in ostia closure. Poor ventilation and accumulation of mucus then produce the conditions required for bacterial infection. Sinusitis is a very common condition, affecting 31 million Americans each year; 30% of the United States population have sinusitis at some point in their lives. The average adult has three to four upper respiratory infections a year; 1% of these infections are complicated by sinusitis, accounting for 16 million visits to the doctor each year. After inducing adequate vasoconstriction with cocaine or ephedrine, the surgeon locates the middle turbinate, the most important landmark for the FESS procedure. On the side of the nose at the level of the middle turbinate lies the uncinate process, which the surgeon removes. The surgeon opens the back ethmoid air cells, to allow better ventilation, but leaves the bone covered with the mucous membrane. Following this step, the ostium located near the jaw is checked for obstruction and, if necessary, opened with a middle meatal antrostomy. This surgical procedure often greatly improves the function of the osteomeatal complex and provides better ventilation of the sinuses. It minimizes bleeding and scarring. As with many diseases, the history of a patient with sinusitis represents a key part of the preoperative evaluation. Before considering FESS, the ear, nose and throat (ENT) specialist will proceed with a thorough diagnostic examination. The development of such diagnostic tools as the fiberoptic endoscope and CT scanning has greatly improved the treatment of sinus disease. The fiberoptic endoscope is used to examine the nose and all its recesses thoroughly. The specific features the physician must examine and evaluate are the middle turbinate and the middle meatus, any anatomic obstruction, and the presence of pus and nasal polyps. CT scanning can also be used to identify the diseased areas, a process that is required for planning the surgery. It shows the extent of the affected sinuses, as well as any abnormalities that may make a patient more susceptible to sinusitis. FESS is usually performed under local anesthesia with intravenous sedation on an outpatient basis with patients going home one to two hours after surgery. It usually does not cause facial swelling or bruising, and does not generally require nasal packing. FESS usually does not cause severe postoperative sinus pain. After the procedure, it is important to keep the nose as free from crust build-up as possible. To achieve this, the surgeon may perform a lengthy cleaning two to three times per week or the patient may perform a simple nasal douching several times a day. Normal function usually reappears after one or two months. In patients with severe sinusitis or polyps, a short course of systemic steroids combined with antibiotics may quicken recovery. The most serious risk associated with FESS is blindness resulting from damage to the optic nerve. The chances of this complication occurring, however, are extremely low. Cerebrospinal fluid leak represents the most common major complication of FESS, but it occurs in only about 0.2% of cases in the Unites States. The leak is usually recognized at the time of surgery and can easily be repaired. Other less serious and rare complications include orbital hematoma and nasolacrimal duct stenosis. All of these complications are also associated with conventional sinus surgery and not only with FESS. The FESS procedure is considered successful if the patient's sinusitis is resolved. Nasal obstruction and facial pain are usually relieved. The outcome has been compared with that of the Caldwell-Luc procedure and, although both methods are considered effective, there is a strong patient preference for FESS. The extent of the disease before surgery dictates the outcome, with the best results obtained in patients with limited nasal sinusitis. According to the American Academy of Family Physicians (AAFP), FESS usually has a good outcome, with most studies reporting an 80–90% rate of success. Good results have also been obtained in patients who have had previous sinus surgery. Image-guided endoscopic surgery. This method uses image guidance techniques that feature a three-dimensional mapping system combining CT scanning and real-time data acquisition concerning the location of the surgical instruments during the procedure. It allows surgeons to navigate more precisely in the affected area. The surgeon can monitor the exact location of such vital organs as the brain and eyes as well as positively identifying the affected areas. Caldwell-Luc procedure. This procedure is directed at improving drainage in the maxillary sinus region located below the eye. The surgeon reaches the region through the upper jaw above one of the second molars. He or she creates a passage to connect the maxillary sinus to the nose in order to improve drainage. Bhatt, N. J. Endoscopic Sinus Surgery: New Horizons. Independence, KY: Singular Publishing Group, 1997. Bhatt, N. J. The Frontal Sinus: Advanced Surgical Techniques. Independence, KY: Singular Publishing Group, 2002. Marks, S. C., and W. A. Loechel. 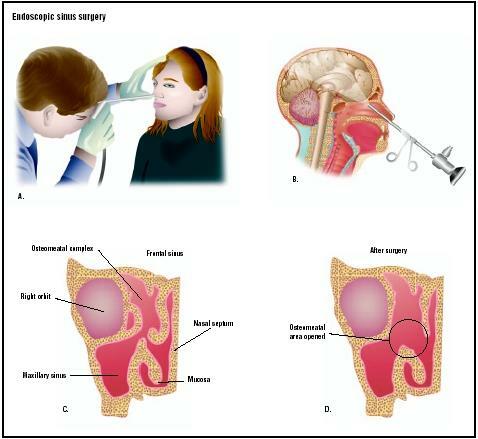 Nasal and Sinus Surgery. Philadelphia: W. B. Saunders Co., 2000. Engelke, W., W. Schwarzwaller, A. Behnsen, and H. G. Jacobs. "Subantroscopic laterobasal sinus floor augmentation (SALSA): an up-to-5-year clinical study." International Journal of Oral and Maxillofacial Implants 18 (January-February 2003): 135–143. Graham, S. M., and K. D. Carter. "Major complications of endoscopic sinus surgery: a comment." British Journal of Ophthalmology 87 (March 2003): 374–377. Larsen, A. S., C. Buchwald, and S. Vesterhauge. "Sinus baro trauma—late diagnosis and treatment with computeraided endoscopic surgery." Aviation & Space Environmental Mediciine 74 (February 2003): 180–183. Ramadan, H. H. "Relation of age to outcome after endoscopic sinus surgery in children." Archives of Otolaryngology & Head and Neck Surgery 129 (February 2003): 175–177. Wormald, P. J. "Salvage frontal sinus surgery: the endoscopic modified Lothrop procedure." Laryngoscope 113 (February 2003): 276–283. American Academy of Otolaryngology-Head and Neck Surgery. One Prince St., Alexandria, VA 22314-3357. (703) 836-4444. http://www.entnet.org/ . Association for Research in Otolaryngology. 19 Mantua Rd., Mt. Royal, NJ 08061. (856) 423-0041. (301) 733-3640. http://www.aro.org/index.html . North American Society for Head and Neck Pathology. Department of Pathology, H179, P.O. Box 850, Milton S. Hershey Medical Center, Penn State University School of Medicine, Hershey, PA 17033. (717) 531-8246. http://www.headandneckpathology.com/ . "Factsheet: Sinus Surgery." American Academy of Otolaryn gology—Head and Neck Surgery [cited May 5, 2003]. http://www.entlink.org/healthinfo/sinus/sinus_surgery.cfm . Slack, R. and G. Bates. "Sinus Surgery." American Family Physician . 1 September 1998 [cited May 5, 2003]. http://www.aafp.org/afp/980901ap/slack.html . This procedure is usually performed on an outpatient basis by an ear, nose, and throat (ENT) specialist, such as an otolaryngologist or an ophthalmic surgeon. ENT physicians are graduates of a school of medicine and typically undergo an otolaryngology residency with further specialization in sinus disease and endoscopic sinus surgery. Why is sinus surgery required? How many endoscopic sinus surgery procedures do you perform in a year? i have problem of post nasal drip and allergic rhinitis. and also have nasal septum and large bone in my right nose. can nasal surgery will be effected for me. This is a very informative article. I have conveyed some of the info to my fianc�e as she was on her way to see a GP about her accute sinus pains since yesterday. I had this surgery a few years back. Ever since, I have had a bad sinus headache. I've spoken to my Dr. several times addressing this issue, but all they tell me is that my sinuses don't look blocked and they have no explanation for my headache. Is this a side effect that others have or is this just me? I have been suffering for years now and it is affecting my quality of living, depression, etc. If I had some new info to present to my Dr, maybe he can actually help me. Thank you. I think you are the ringt one to ask.....My husband is having sever headaches every day.He had his maxillary sinus surgery in 2002.Now his frontal sinuses are blocked.But on the other hand he is not having any symtums of sinus like runny nose and watery eyes.Doctors told us to go for surgery,but are saying that they don,t think his headaches are related to sinus.They said there is 50-50 chances if his headaces will go off or get lesser... I am worring about the leakage risk during this surgery..pl.tell me percentage of that risk and also tell me if the surgery will help his headache?????? hi, for 8 years i have been getting sinus infections my my sym include massive migrains ,stuffed nose ,face and teeth pain sometimes even nose bleeds and I was thinking about getting the surgery .do you think that Fess will help ?? I had sinus surgery 1 1/2 yrs ago for a bad smell in my nose. After the surgey the bad smell returned (which turned out to be a pseudomonas infection) along with a terrific headache that i didn't have before. Now i have constant head pain from the surgery. Think twice before having this surgery. I can't find any dr to help me with this pain. Drs are anxious to give you the surgery but when a complication arises they will wash their hands of you and tell you it's all in your head, so be well informed! What is this bad odor in my nose after sinu surgery? I had sinus surgery done by Dr. Ardito 12/7/09 located in Paoli, PA. During my surgery, the surgeon left my sinus cavity, fractured a bone which my muscle entered. When the muscle finally released with help from Wills Eye Hospital it was damaged. I was operated in March. It is now a year later. I have double vision, nerve damage, and now I find out my right sinuses were never fully cleaned (which I thought all along). Ask about the risks...I was never told this could happen. My entire life has changed and it will never be the same. The damage is permanent. I now have a contact that blurs the eye out permanently. I had an operation. since that I lost quality of life, lack of smell sensitivity, waterly runy nose, constant pain in right nose that I had never had. Nose no longer functions as used to be. I do not have any benefit out of the surgery. Now I have to suffer all my life. Sinustis was harmless for living. It was just temporaly situation when I had a cold simptom,I think. Try alternative treatment without operation, I suggest you patients. Just trying to help. Because i know how suffer it is to let be operate and then not to have the right antidote to prevent it from breeding again. After reading this comments and after my experience with sinus surgery I wouldn't recommend it. I had surgery in 2001. The purpose was to remove polops by"scraping"
After the surgery I had severe and painful headaches. They went away after a few weeks, but they can recur anytime, especially after a bad cold or flu. I still get them every few years and they are awful. I recently went to a neurologist and He was quite sure they are the result of sensitivity of the scar tissue. Apparently the situation is not curable. I had sinus surgery 3 years ago and I am now suffering from chronic headaches. I wake up every morning with a headache. The pain is located right between my eyes and it feels as if someone has punched me in the nose. The headaches are severe and nothing seems to help them. I have had a cat scan done and was told it appeared nothing was wrong. I am going to a neurologist and/or an ENT within the next week. I truely believe the headaches are somehow related to the sinus surgery. I do not have any other symptoms, such as stuffiness or sneezing. Just the terrible daily headaches that always start overnight. Any comments or suggestions?? I am going to have the CT scan guided surgery at University of Pennsylvania on Tuesday. This was all explained to me in detail. I was also told that there will be a drilling thru my bone to get to two of my sinuses but pain and swelling would be minimal. I am not sure what bone but did not mentioned it would be in my mouth? They also said this could be done outpatient but recommended an overnight stay due to non-malignant growths of bone and birth defects which may make this surgery a bit long, close to 4 hours they said. Wish me luck all. I have seen the best I am told with Dr. David Kennedy at University of Pennsylvania. His staff was wonderful, extremely thorough and reviewed my scans and MRI even from 20 years ago. I feel VERY comfortable going into this surgery. Any comments or helpful hints or suggestions to help me prepare for after care/post operative pain or help needed? I was told no work for at least a week or two. Is this true? Has anyone seen this take that long? Side effects other than above? I wear contacts so hopefully my old glasses will work for me. I do not plan to drive and have taken the week off work to stay and get better. I had sinus surgery 6 months back and during operation doctor said it would only take one week to get well. but ever since I had surgery, I have head aches and these are worse than I had earlier with sinusitis. yes I don't suggest anyone to go for surgery until and unless 100% required. better to avoid foods and drinks which aggrevate sinusitis and protect yourself from cold weather. instead try some other medication for sinusitis and don't go for surgery. I had a left maxillary mucus retention cyst that was blocking my right side 100% and a left deviated septum repair 2 and 1/2 weeks ago. Every since then I have had a severe sinus migraine. I had no headaches prior to surgery and this is just ruining my life. Cannot drive, don't know how I am going to be able to back to my job as a teacher, sensitivity to light and sound, ears are cracking and popping. I wish I NEVER went through with this surgery. I am not snoring as much at night, but would gladly change everything back to the way it was prior to surgery...Good luck to all and think it over very carefully before choosing surgery! Anyone reading this who is considering sinus surgery should run and hide from the ENT surgeons! I had sinus surgery 4 years ago to combat sinus infections. I was frustrated by these infections 3 to 4 times per year, so I decided to go in for the procedure after hearing about someone who had this done and was happy. The surgery left me with constant headaches, some manageable, many so severe that laying in bed is the only option. After 18 months of trying to figure out what was wrong with me, I decided that I needed to call Mayo Clinic. The ENT doc could not find anything wrong with me, so he referred me to the headache clinic. The neurologist who was assigned to me(Dr Cutrer) came into the room and and within two minutes had diagnosed me (he sees one to two people like me a week, who were at the end on the line and ended up at Mayo). He stated the problem was the small fibrous nerves that were designed to protect the head were damaged from the removal of the sinus tissue. The nerves reside throughout the tissue, so they would be always cut during this procedure. The nerves should or could repair themselves normally, but in my case they have rewired themselves incorrectly, causing false signals being sent to my brain. These false signal are telling the brain their is a problem, when there is actually no problem. The main issue is the severe headaches from the damage to the small fibrous nerves. The treatment that I was prescribed is Gabapentin 300mg. The drug is designed to suppress the nerves, it does usually work; the problem is you can top out of the maximum dose, and then have no where to go. I had seen many other Dr's, and it took a very high end Mayo Dr to figure this out. There is no cure!! I'm stuck trying to make the meds work (yes there are med side effects too)This has been the worst decision by far that I have ever made, my life is effected every day due to this. I have 3 young children to raise, and thanks to Dr. Douglas Raedy Portage Michigan, it is a monumental task just to get through a day. I'm beyond mad, I would not wish this on anyone (except Dr Raedy himself, run from this idiot for sure), the anger from this just should not exist. The bottom line is the vast majority of sinus surgery is not needed, the thickeneing of the sinus cavities does not need surgery. A simple sinus rinse would probably help the majority of people (just ask an RPH at the local Walgreens or wherever). Just stay away from sinus surgery!! If you had it done and have headaches, then you have either temporary or permanent nerve damage. Go find a neurologist at a high caliber headache clinic. I had sinus surgery 5 months ago. My only symptoms were that I sounded nasal and was tired. The CT scan showed that I had chronic sinusitis so I was convinced that if I had this surgery, with septum reconstruction, all would be back to normal. I still sound nasal / stuffed up and I feel worse than prior to the BIG dollar surgery. Since my ENT charged $900 for the first office visit I will probably just throw in the towel and accept the problem. I will NOT go thru this surgery again. I had sinuse problem for years and had a surgery 6 years ago which helped and was fine but, few attacks here and there that went away with antibiotic. For past 4 month I been very sick with headache, took all kinds of antibiotic and storied with no result. The cat scan showed upper left sinus blockage. My ent who is well known in NYC referred me to another ENT to do the surgery and open up the blockage. I would like to know if anyone has done this and what is the success rate? Also could anyone refer a good ENT in NYC area that specialized in upper sinius surgery. i am very sick every day and i feel like sinus surgery might be the only way to be healthy again. my body always aches an feel like i have the flu. no energy to run or even walk slot. Does any one know any other ways to get well besides this ssurgery if no antti biotics worked and just make me sicker? i just dont know what to do any more.. I am scheduled to have the sugery, at this point there is no alternitive for me. This all started for me in Oct. of 2012, I went to the local Urgent Care ( my Dr. was booked) to summerize I have had 2rounds of Z packs a sulfa based (cillian allergy) and Cipro for antibiotics. After finally taking it upon myself to schedule an appt. with ENT I had a CT scan, the scan showed a severe infection of some type ( not sure if bacterial or fungal, however culture showed no bacterial growth in 2 days). My entire lower left cavities are 100% full, no air at all, it also showed the right side starting to fill. I am very thankful to my ENT for taking action right away. I do have frustration with the urgent care and insurance if someone had just done a light test or examination other than just looking at me this wouldn't have gone on so long. All I heard from Urgent care was heres some antibiotics, its just rebound congestion here is some more antibiotics, use the netti pot twice a day for two weeks heres some more antibiotics. Then you have to navigate through the insurance crap, you need a refferal, you need to have a course of antbiotic treatmeant before you can do this or that, then you can see a specialist if you dont you wont be fully covered. Ummm, what, really? Lets see, my nose, throat and ears hurt who should I go see?! If this had been caught sooner maybe I wouldn't need sugery, its just ridiculas to me that urgent care means "I really dont have to pay much attention to you at all. After reading all these posts I am more nervous, I am going ahead with the sugery, I just cant take the pain anymore. I will repost after to update, I do appreciate the other posts so if I am any simular issues I know at the very least what to have looked at. I have suffered from chronic sinusitis for many many years. At first it was treatable with antibiotics but due to the frequency of the infections I became allergic to the antibiotics. After that my ENT Dr began treating me with steroids in the step down dosage packs. This helped a lot but I did not want to have to take steroids so much. Finally he recommended that I have a septoplasty. That surgery was wonderful for the first 3 years, I had almost no sinus infection and I could breath for for the first time. The only issue I had at first was that the incision in my nostril never healed right the scar tissue would scab up and it would cause mild pain and pulling in my nostril. At year 3 I began having sinus infections again, not as bad as before the surgery but enough to be bothered by them. I also started getting upper respiratory infections with the sinus infections. The URI's were the worst. My ENT Dr explained that the septum has whats called memory and over time it can begin to revert to its original shape (my was in the shape of an S almost completely blocking one nostril). It is not 4 1/2 years since my septoplasty and its now very noticeable that my septum is curved, it has cause my nose to become crocked. I spoke with my ENT about the problem and she does not suggest redoing the surgery as it will weaken the septum which could cause me additional issues. I have consulted a plastic surgeon about having my nose restructured to aid in my breathing along with having the openings to my sinus fractured to widen them. I belive it is similar to FESS but I'm not exactly sure as the surgeon did not mention FESS during our consultation. Has any one had the openings to there sinus fractured to help with sinusitis? I have had five sinus surgeries over the past 16yrs.The pus and foul smell from my mouth and noise has kept me going back with the hope this will be the last one. whats the complication after surgery of maxillary sinus? I live in the UK and although we have the benefit of NHS, I have to wait 4/5 months between consultant apps and so far nearly a year on I am getting worse and nothing being resolved. I was perfectly healthy 48 year old woman before surgery who other than experiencing chronic catarrh and scans revealing diseased sinuses! I led a healthy and active life. I am trying to start up physical activity again but I am struggling big time and no one will take responsibility in helping. My GPni fell is despairing on my behalf. I currently take a steroid spray and decongestant for my nose and constant lubrication for my eyes with now trying heat pad therapy. I would not recommend surgery unless is the last resort as has wrecked my life. Any suggestions or shared experiences would help greatly. Only consider FESS/Septaplasmy as last resort. Unfortunately I was not for warned of any of this, which is why you need to know. DO NOT RISK THE SURGERY! i am having very major sinus problem my doctor said to me for FESS surgery for drainage nasal way but i am confused. it is 100% cure. We got our 15 yr son opetated onENT advice for septum and mini fess we were told he will be back to school in 5 days .It is a month and we are a mental wreck with guilt .he still has cold , blocked nose and worse, discoloured mucus . Suctions are a torture for him and we feel like we are caught in a situation where we hate ENT visit but cant do w/o . ENT should clearly explain post op situtions to patients so tbat they can be mentally prepared. I had sinus surgery 11 years ago and have had a severe sinus headache every day since. The pain is unbearable 24/7. I have not been able to work and lost a job that paid me 75K. Please stop telling people that this surgery is easy and effective. It ruined my life. If anyone out there is thinking about this surgery, do not do it! Doctors only care about money. I have never found one that actually cared about helping me. I had sinus surgery almost 3 years ago. I still have problems almost everyday. I am always so congested it makes me dizzy and sick feeling. I feel like I live on Mucinex severe congestion. I take it everyday all day long. Please help if you can, I am so tired of living like this. I had B/L FESS and Septoplasty done to treat Chronic Sinusoitis condition in the year 2011. However soon after surgery two dark spots appeared in left eye, which are painful and come and go, in the field of vision. When they come they are painful and usually cause headache also. They also interfere in driving and sustained reading activities. I have shown to several opthamologists, who have done a fundus examination and said these are floaters, quite harmless and also never painful. However, one opthamologist said that a blood vessel has burst inside left eye, caused by B/L FESS and Septoplasty done on the nose. But, regular use of eye drops, has not dissolved the two dark spots in left eye. Please help, if you can. I am quite fed-up of seeing opthamologists. I had FESS just 3 days before.. I am pretty scared with the reviews. I have smell quiet normal. No headache as of now. will it get worse? I'm really sorry to you all who had bad experiences! i had the surgery done. Polyps remove,resect left turbinate. Thankfully I feel great, prior to surgery I was not able to smell and breath trough my nose. I now can smell and breath like a baby. I had small headaches but it all disappear and I'm now back to my activities. I wish you all the best and hope you feel better. For those who dont want surgery i heard Lime juice rinses are great for sinus problems. Namaste! I am suffering from 10yrs. Left side of my face is filled with mucous . That mucouse come into my throat but i cannot throw my cough from mouth. Sometime left side headache occurs and sometime throatache. Ct scan shows only mild thickness. My ent doctor says that they do surgery when infection will occur or sinuses will filled. I am in great trouble. I am at a desperate point in my life with absolutely NO idea what to do, and beyond frustrated! First of all I'm a 53 year old F on Medicare, due to being on disability (4 back, 2 neck srgys), so that in it's self creates a prob. I had sinus srgy approx. 3 mon ago, and have had a staph infctn ever since! On July 21st I went to the dentist, and was told I have an upper left broken tooth that NEEDS to be pulled immedatly! However, due to my neck implants and recent sinus srgy, he can't pull it! I basically begged him to pull the damn thing, and told him I would even sign a waiver, but he wouldn't, and showed me the x-rays as to why...he told me I need an oral surgeon to extract it. I have a Cigna Medicare Supplement, and called them to see if they would cover the procdr if medically necesry, and they told me YES! However, I can't find 1 oral surgeon, NOT EVEN 1 who takes my ins! My body is SO FULL OF INFECTION IT'S UNBELIEVABLE! I simply DONNOT KNOW WHAT TO DO...I LIVE IN SE KANSAS. ANY IDEAS WOULD ME GREATLY APPREACIATED!!! Ive had surgery to repair hole in sinus that went unnoticed after an accident as a 10 year old i contracted meningitis every 3 years wich almost killed me even after vaccinations i contracted it yet again when doctors realised something wasnt right after scans it was explained to me that my skull sinus had a hole which was leaking and thats how i was contracting meningitis and that my brain was pushing through said hole and i needed surgery where they would cut bit of brain away which could affect smell maybe speech and repair hole causing csf leak it was alot to take in but i got surgery opened skull from ear to ear in a zigzag line . If anyone suffering lots of headache problems even check By ENT doctor then you need to go Neurophysion that doctor well treat as this headache problem. I told you that because suffered this problem.